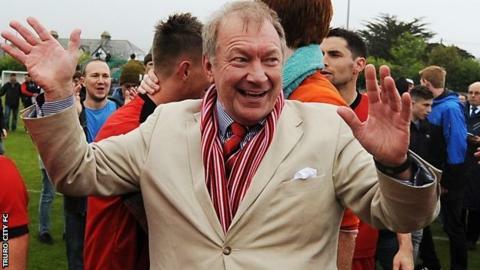 Truro City manager Steve Tully has hailed chairman Peter Masters after the club were given planning permission to build a new stadium. City hope to move in to their new ground at Silver Bow at the start of next season, having almost gone out of business in December 2012. "He took over the club when it was on the brink of going out of business," Tully told BBC Radio Cornwall. "What he's achieved in the short time he's been here, is a massive thing." Truro are back in National League South after winning promotion last season following two years in the Southern Premier League. "Over the short space of time, the work that he's done at the club is a credit to him," added Tully, who was appointed by Masters in March 2014. "If it wasn't for him we'd have to question whether there'd still be a Truro City FC. "He's a chairman that wants to strive to get better and myself and Wayne (Carlisle, assistant manager) love that because we know that we've got to keep pushing. "If you've got someone who's always on your back wanting more, wanting to get better, it can only help you as a person."